Me and Mike caught our one way flight to Flores looking like zombies. 3 solid nights out in Bali kind of has that effect! We caught up on a bit of sleep on the plane before arriving at our destination, Labuan Bajo, in the west of Flores. We were keen on booking a 3day/ 2 night scuba diving liveabord to explore some of the best dive sites around Komodo National Park. But it turned out to be quite pricey with no last minute deals being offered. So we opted for day diving instead which meant 3 dives per day but coming back to land and staying in the accomodation provided by the dive company rather than staying on a boat. The accomodation was great and it was the first time we had air con for a long time! Now I'd read stuff on the internet and heard stories of how strong the currents can be around Komodo so I kind of knew what to expect. Even before getting into the water the swirling currents were obvious from the surface but our Dive master was very experienced and provided good guidance. We enjoyed 3 days of scuba diving and completed 9 dives all in all. Up to 30 metres visibility on some sites, loads of turtles, reef sharks and moray eels amongst a billion other things! On our first day one of the sites we visited was called Batu Balong and this proved to be my favourite. From the surface it looked nothing more than a few rocks protruding from the sea. But underneath the place was buzzing with marine life! The coral there was perfect! Alive, colouful and plentiful! The current either side of the site was very strong and it would have been easy to have been swept away so we only explored the one side. We also dived at Manta Point which is teaming with HUUUGE Manta Rays in some months of the year. We spoke to people who had seen them on the days before and after we dived but unfortunately they were hiding from us during our dive! But we found a nurse shark and an octopus so that made up for it! On our second day we had a drift dive at a site called Siaba Kecil. The current at the site was really strong so the idea is to jump in at one part of the site and let the current carry you along. I never enjoyed this one as I was always kicking one way and being dragged the opposite. At one point I nearly lost the group as they caught shelter from the current in a cave wall as I was being swept down current. I felt like I was being sucked down a river and it wasn't nice not being in control! On our third day one of the sites we visited was called Castle Rock and it was top class. Again, very strong current around the sides of the rock so we stayed close to our dive master to make sure we werent swept away. This site was teaming with sharks. We spotted 6 in a row at one point! Also giant trevally's, tuna and a blue spotted stingray. Our final dive in Komodo was at Tatawa Besar, here we were treated to more amazing coral, several turtles and a rare eagleray. The 9 dives around Komodo National Park puts my tally at 42 dives, I'm starting to feel like a pro! I have to say Komodo National Park is up there with some of the best dive sites I've visited around the world. On our last night we hit up a Reggae Party with a couple of german girls that we met on our flight from Bali. The whole of Labuan Bajo seemed to be there and it was a decent night. Taking a bottle of the local spirit 'Arak' was definately a good idea although we all paid for it the next day! Rather than being boring and booking a flight back to Bali we decided to go on a 4day/ 3 night cruise to the Gili Islands where we were going to meet back up with our pete. There was around 13 of us on the boat and everyone seemed to be nursing killer hangovers from the reggae party the night before. Needless to say there was very little socialising initially! But as the day went on we found that that we had a good group of people (even though it was a bit of a sausage fest). On our first day we stopped off at a couple of really good snorkelling sites then visited Komodo Island, home to the legendary and deadly Komodo Dragon! 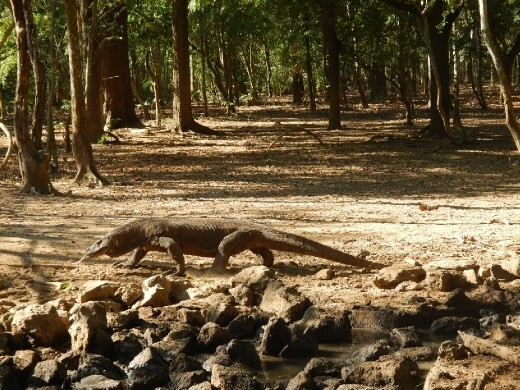 We were guided around the island by a park ranger and spotted a number of giant komodo dragons. It was amazing to see them in their natural habitat! In the evening we anchored up and all done a bit of fishing off the side of the boat (with limited success). On our second day we visited Rinca Island which is also home to the Komodo Dragon. Again we were guided around the island by a park ranger and spotted a few more dragons. We followed one for a while until it reached a waterhole. Also got to see it poo which was interesting! Later on we visited and snorkelled around a couple of small deserted islands that were just breathtaking. Small white tips of sand emerging out of crystal blue water! The sand islands couldnt have been bigger than 30 metres in length, only thing missing was a palm tree! On our third day we visited an island with a waterfall, we were all delighted to finally have some fresh water as there was no showers on the boat! We spent the rest of the day sailing and were treated to a lovely colouful sky as the sun set behind Mount Rinjani on Lombok in the distance. As if that werent enough we had a pod of dolphins swimming at the front of our boat too! All this whilst sipping a can of bintang beer, it just couldnt get any better! That evening we were out in the open sea and the boat got VERY rocky, we were all trying to sleep on the top deck and were rocking and rolling from side to side. As the night went on it eased off and by the time we woke the next morning we were anchored up next to Lombok and the Gili Islands were just a stones throw away.